Kerns is a charming neighborhood in Northeast Portland, the "Gateway Neighborhood to the Eastside," is known for its fantastic restuarants, peaceful parks, tree-lined streets, sweet bungalows, and a close-knit community. Located in a popular area filled with quaint restaurants and pubs and wonderful coffee shops, residents of Kerns enjoy historic homes, beautiful, lush gardens and lawns, and plenty of gathering spots for the whole family. The neighborhood is bordered by East Burnside, a major thoroughfare through Portland's east side the provides easy access to Downtown Portland. As you wind your way down the neighborhood's streets, you can't help but point out house after house just bursting with historical charm and gardens full of tomatoes and wildflowers. 28th Avenue and Glisan have become popular restaurant scenes, bringing some of the best chefs in town to serve up truly amazing food within walking distance. With the charm of a small neighborhood and easy access to Downtown via the I-84 freeway and MAX light-rail transit line, the Kerns neighborhood is in the middle of it all. The Kerns Neighborhood Association is always seeking Kerns neighborhood residents who would like to participate in the decision-making process of all activities and happenings within the neighborhood. This organization is a great way for your personal views on crime, zoning, taxes, planning, business, development, transportation, and many other issues to be heard -- and have direct influence in city government on a local level. For more information about Kerns Real Estate, read on! Kerns is located in northeast Portland, and is bordered by the Willamette River to the West, Interstate 84 to the North, and 32nd Avenue to the East. The southern border of the neighborhood follows Burnside towards the east, taking a southerly turn at 28th to Stark, and continues eastward on Stark to 32nd Avenue. 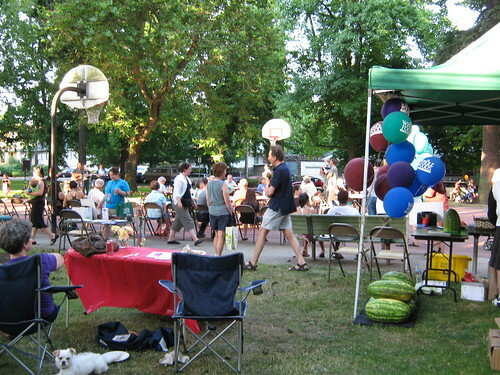 The Kerns neighborhood is bordered by the Buckman neighborhood, Lloyd district, Sullivan's Gulch neighborhood, Laurelhurst, and Sunnyside neighborhood. Schools include Benson Polytechnic High School and da Vinci Arts Middle School. Kerns was one of the first nieghborhoods to develop on Portland's east side. Touching the Willamette River, the Kerns neighborhood was a center of turn-of-the-century industrial and fishery activity. The river, rail, and freeway access necessary for industrial growth have placed international and local companies such as Jantzen, Coca-Cola, and Franz Bakery within the Kerns' boundaries. Kerns home styles range from classic Old Portland architecture, Craftsman bungalows, Victorian two-stories, tudor cottages, Foursquare homes and more. In addition to the wide variety of single-family homes, the Kerns neighborhood features many apartment buildings and modern condos. If you are interested in buying or selling a home in the Kerns neighborhood, visit the McDonald Group Home Page for more information, or click here to search for homes for sale in the Kerns Real Estate Market. Kerns Neighborhood Clean-Up: Neighborhood volunteers team up for a day for strolling the community picking up litter and chatting with friends. It's the perfect way to get to know the people living on neighboring streets and form a true connection with the local area. Kerns has many public green spaces in addition to the beautiful tree lined streets and lush private lawns and gardens, including Everett Community Garden (1988), Buckman Field (1920), and Oregon Park (1940). Redux - 811 E Burnside - They have a pretty neat theme going on in here: many of the items are recycled or upcycled so they're creatively eco-friendly. It's a fantastic place to purchase a gift. Redux has so many different styles of jewelry by many local designers. Twisted - 2310 NE Broadway - This is the best local yarn store you'll ever find. The staff is friendly, knowledgeable, and willing to help you choose yarn to suit your project. They have the most extensive collection of sock yarn in the whole city, as well as a very comfortable area to relax and knit/crochet with other patrons. There's a nice range of yarn prices here, and you can find both inexpensive yarns and expensive luxury fibers. Rock n' Rose - 616 East Burnside - This quirky shop sells high-end vintage casual, used designer, and new clothing in their hip lower east burnside location. With a real focus on quality and careful selection, you wont be disappointed. It's a great place to find new and used clothes that are a good quality and the latest and greatest fashions. Some is funky, but that is what is definately in! Screen Door - 2337 E Burnside St Portland, OR 97214 - Locally-sourced and southern-fried, everything on this menu from the Cajun eggs Benedict in the AM to the evening’s brined and fried chicken (the best you'll ever have) keeps the locals lining up for up to an hour. Trust us, it's worth the wait. Le Pigeon: 738 E Burnside St Portland, OR 97214 - Gabe Rucker’s East Burnside hole-in-the-wall has an open kitchen, a short menu, and a firm handle on how to make inventive but mostly accessible food. This is where you’ll find pickled onions on your burger and foie gras in your profiterole, but it’s also where you’ll find some killer fried green tomatoes on your pork belly and a really good namesake chicken-under-a-brick. Tabla: 200 NE 28th Ave Portland, OR 97232 - Tabla’s three-course prix fixe meal is one of the best deals in town. A northern Italian menu heavy on the handmade pasta, this northeast 28th corridor restaurant is noisy, busy, and relaxed.